The “Blog” of “Unnecessary” Quotation Marks: Let's see the birth certificate! Jackie and Becca spotted this while visiting John Wayne's birthplace in Winterset Iowa. 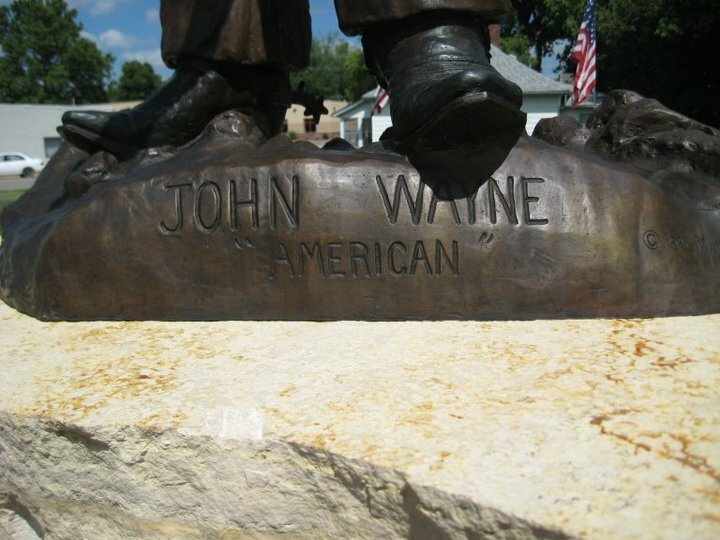 Despite being in John Wayne's home town, it seems that there is some skepticism about his citizenship. Obviously reluctantly written by overly proud Iowans who wanted to tout his status as 'Iowanite'. If he was a Mexican immigrant, he sure fooled me. I think this actually is referring to testimony Maureen O'Hara gave in Congress. She was pushing for a medal of honor to be awarded to John Wayne and she asked that it say just one thing "American". So these quote marks may actually be quoting someone! They should have referenced Maureen as the speaker though. Aren't quotation marks used to delineate the title of a work of art? If so, perhaps the statue is titled, "American." Erick, in that case, is John Wayne the sculptor? So funny! Just found your blog. Thanks for the "smiles".